In today’s world, capturing memories is easier than ever. Since technology is quite literally at the tips of our fingers, we are the constant subjects of our own documentaries. The centerpiece of these stories is emotion, which can be difficult to capture authentically. There are so many photos we’ve seen that convey incredible emotion. You probably recognize some of those famous photos in which the photographer is able to capture and evoke a strong emotion in us as well. But how does one capture the moments that really move us? Here are a few things I keep in mind when I’m trying to catch emotion. Keep it simple. I have always followed the KISS (keep it simple stupid) method in everything I do – especially taking photos. If you overthink the shots, or try to force a feeling, your subject will look and feel unnatural. Ever noticed how, when you are asked to smile for a photo, you appear much less happy than when you’re smiling in a candid shot? That is an example of why it’s important to be involved in the moments you’re capturing! Let yourself and your subject be natural and you’ll find the best photos. Making them feel comfortable will only lead to great results. Shoot from the hip. Don’t get caught in planning the moments you’re going to shoot down to the most miniscule detail. Let spontaneity be your guide and you’ll capture those genuine moments. If this is a professional shoot, try to let it be natural. Shoot from the hip and keep your subject distracted. Sometimes the best photos are the ones in-between the moments you intend to capture. Occasionally, the best photos you’ll get are when your subjects aren’t even looking. I often like to take pictures before and after people pose for the camera. Some of the best photos come from these “unexpected” shots. Background is as important as figure. Sure, eyes and face can convey emotion and take wonderfully emotive pictures. Close-ups of expressive faces are wonderful. However, in a lot of my favorite photos, the surroundings are just as important as the subjects. 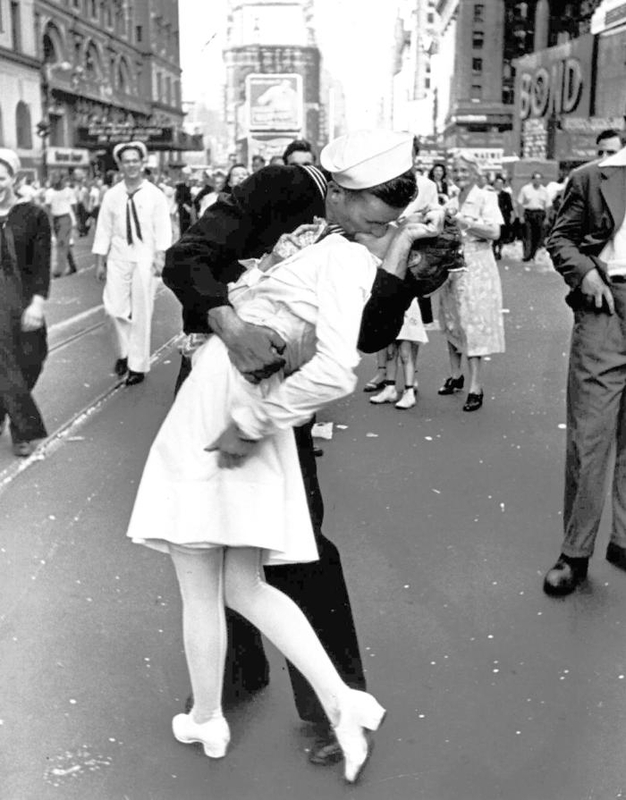 Would the iconic photo V-J Day in Times Square be nearly as impactful if there wasn’t a celebration going on around the subjects? They’re the most important aspects of the photo, of course, but the surroundings are also integral in telling the story and demonstrating emotion surrounding that photo. These tricks have always worked for me in photo sessions, but experimenting is really the key. Capturing great moments with tons of emotion comes from spontaneity. I learn a lot of this by looking at the photos I take with my phone. When I’m capturing photos with my phone, I’m usually trying to grab a moment that makes me feel something, whether it be after the buzzer at a championship basketball game or a moment that is tense or sad. Capturing these emotional moments is not easy. But overthinking won’t make it any easier. Be in the moment, even if you’re behind the camera. If you’re part of the story, let yourself be! Enjoy yourself, and you’ll see that enjoyment in every photo you take – be it of yourself or your subject.